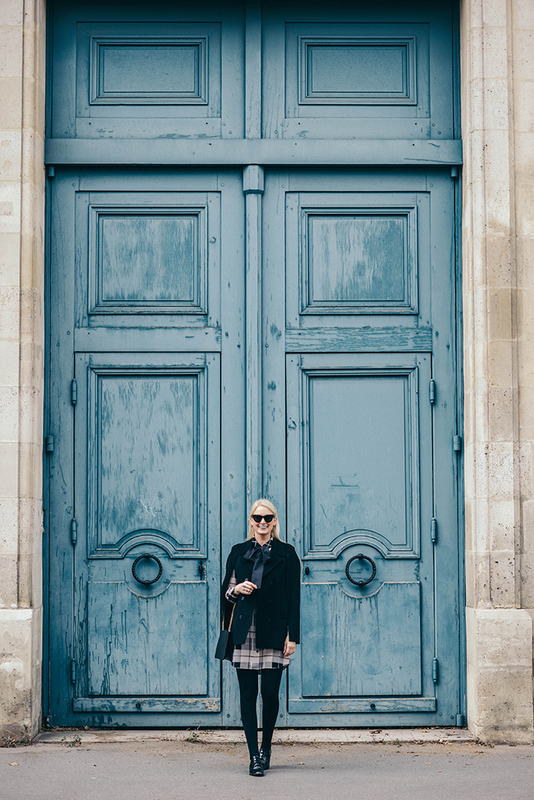 I know it’s a little hard to concentrate on the outfit with these magnificent Parisian doors, but let’s try, shall we? This check-print dress is a favorite fall work look. The silhouette is perfect for the office: long sleeves, a slightly longer hem (at least on you shorter gals! ), and a sophisticated print that’s not distracting. There’s also an adorable bow to tie at your neck, and we all know how much I love a good bow blouse! This is an ideal work-to-weekend look, don’t you think? Just switch out the oxfords for pumps and you’re good to go! If you’re looking for more pieces in this chic check print, feast your eyes on this sequin top, this cozy coat and this flattering midi skirt. PS – stock up on girly stocking stuffers under $100 when you shop Kate Spade’s gift guide. So many cute little things! Happy Friday! that dress is so cute and love your flats. Such a beautiful dress, and yes, that door is so pretty. Makes me miss Paris a lot. This dress would be so cute for Thanksgiving dinner too! You’re right, the door is amazing but so is your outfit! Love, love, love that dress! So charming with the bow detail! Perfect for the holidays! This outfit is perfect!! Love the bow/cape combo. Add the plaid and I’m just totally obsessed. So chic! Love the vest over the dress….wishing it was cool enough in Hawaii to get away with a cape! I love that dress! And the door is magnificient!